familiar food. One has to be exposed to a country’s history, people, culture, customers and manners to some extent to be able to experience the place – limited though it may be and constrained by time. This is what we have tried to do. By three methods we may learn wisdom: First, by reflection, which is noblest; Second, by imitation, which is easiest; and third by experience, which is the bitterest.... and that's the path we have chosen! We should explain. It was in Bursa that we came upon "Uludag". In Turkish "Great Mountain" - the local mount Olympus (one of a few to lay claim that name). 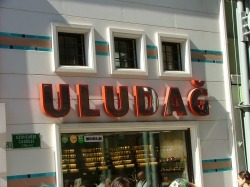 We saw "Uludag" on the sides of lorries, on menus, on shop signs - as here. 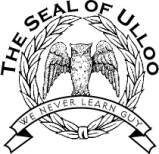 So we took the Ulu part and turned it into "Ulloo" meaning an owl in Hindi. The owl maybe a bird of wisdom in the West but in north India it is a mild form of insult meaning quite the opposite. So we began to use "You Ulloo!" for ourselves and found it amusing. So it stuck to this day. "You Uloos....!" So Bursa is indeed the very home of "Ulu" or should that be "Ulloo"?